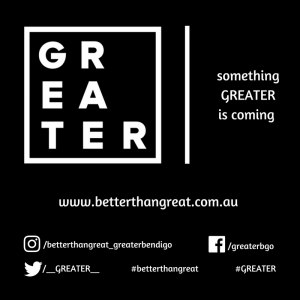 GREATER is a movement dedicated to health and wellbeing- to help our community to be a place where everyone can be their best, where children have a great start to life and families have a community they feel they belong to. As a member of the City of Greater Bendigo community, the movement needs your voice and your action to be GREATER. By working together as a community, it is hoped that the future for our children will be GREATER.To find out more about the GREATER movement, visit their website and facebook pages.